Understanding the mechanisms by which insects (agricultural pests and mosquitoes) develop resistance to insecticides, aiming to develop new means of managing and overcoming this resistance. Exploring biotechnology based approaches for insect control and discovery of novel insecticide targets. I obtained a BSc in Agronomy from the Agricultural University of Athens (AUA) (1992), a DSPU (master) in Horticultural Sciences from the Mediterranean Agronomic Institute Chania (MAICh, CIHEAM) (1993) and a PhD in Insect Genetics from AUA (1997). A NATO and a Marie Curie fellowships took me to School of Biosciences at Cardiff University, UK as a Research Fellow for three years, and the Liverpool School of Tropical Medicine (LSTM). This was followed by a Return Marie Curie and an ENTER (GSRT) Fellowships, which took me to the Institute of Molecular Biology and Biotechnology (IMBB-FORTH) in Crete (2002-2004). 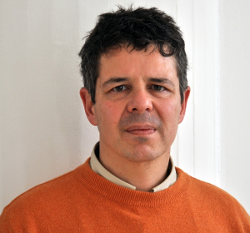 I was appointed as a Lecturer at AUA in 2005, as an Associate Professor at the University of Crete in 2009 and as a Director of the Applied Biology and Biotechnology Division from 2010 to 2012. I spent a brief period at the LSTM again from 2012 to 2013 working for IVCC and then returned to AUA as Professor and Director of the Laboratory of Pesticide Science since 2014. I am also Group Leader of the Molecular Entomology group at IMBB since 2014. We investigate the mechanisms by which insects (agricultural pests and mosquitoes - major vectors of diseases) develop resistance to insecticides and xenobiotics. Our approaches include classical bioassay, to identify resistance phenotypes and biotechnology-based approaches for the identification and validation of resistance mechanisms. The latter include recombinant enzyme-based techniques, which allow the study of in vitro interactions between detoxification enzymes and xenobiotics, as well as in vivo functional approaches, using Drosophila as a model, to analyse the contribution of specific mutations (using targeted mutagenesis CRISPR/Cas9) alone or in combination with ectopically overexpressed detoxification genes, in the resistance phenotype, and their interplay. We also look at the specific expression of enzymes involved in resistance by immunolocalisation techniques, aiming to identify the major attrition points in delivery of insecticide to the target site. 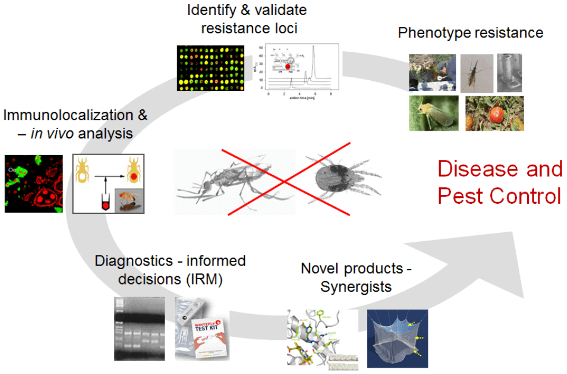 Molecular diagnostics are being developed and used to study resistance dynamics and evolution of resistance in major disease vectors and agricultural pests, in order to inform Insecticide Resistance Management strategies. Tools for in vitro (such as recombinant detoxification enzymes) and in vivo (such as insect lines with defined resistance mutations and mechanisms) screening of novel insecticides and synergists (additives) are also developed. Balabanidou V, Kampouraki A, MacLean M, Blomquist GJ, Tittiger C, Juarez MP, Mijailovsky SJ, Chalepakis G, Anthousi A, Lynd A, Antoine S, Hemingway J, Ranson H, Lycett GJ, Vontas J. (2016) Cytochrome P450 associated with insecticide resistance catalyzes cuticular hydrocarbon production in Anopheles gambiae. PNAS. 113(33):9268-9273. DOI: 10.1073/pnas.1608295113 PMID: 27439866. (134) Çağatay NS, Riga M, Vontas J, Çevik B, Ay R. (2018) Biochemical and molecular characterizations of cypermethrin resistance in laboratory-selected cypermethrin-resistant strains of Tetranychus urticae Koch. (Acari: Tetranychidae). Int J Acarol. 44(6): 262-267. DOI: 10.1080/01647954.2018.1500641. (133) Çağatay NS, Menault P, Riga M, Vontas J, Ay R. (2018) Identification and characterization of abamectin resistance in Tetranychus urticae Koch strains from greenhouses in Turkey. Crop Prot. 112:112-117. DOI:10.1016/j.cropro.2018.05.016. (132) Kampouraki A, Stavrakaki M, Karataraki A, Katsikogiannis G, Pitika E, Varikou K, Vlachaki A, Chrysargyris A, Malandraki E, Sidiropoulos N, Paraskevopoulos A, Gilpathi D, Roditakis E, Vontas J. (2018) Recent evolution and operational impact of insecticide resistance in olive fruit fly Bactrocera oleae populations from Greece. J Pest Sci. 91(4):1429-1439. DOI:10.1007/s10340-018-1007-8. (95) Balabanidou V, Kampouraki A, MacLean M, Blomquist GJ, Tittiger C, Juarez MP, Mijailovsky SJ, Chalepakis G, Anthousi A, Lynd A, Antoine S, Hemingway J, Ranson H, Lycett GJ, Vontas J. (2016) Cytochrome P450 associated with insecticide resistance catalyzes cuticular hydrocarbon production in Anopheles gambiae. PNAS. 113(33):9268-9273. DOI: 10.1073/pnas.1608295113 PMID: 27439866. (58)	Ilias A, Roditakis E, Grispou M, Nauen R, Vontas J, Tsagkarakou A. (2012) Efficacy of ketoenols on insecticide resistant field populations of two-spotted spider mite Tetranychus urticae and sweet potato whitefly Bemisia tabaci from Greece. Crop Prot. 42:305-311. DOI:10.1016/j.cropro.2012.07.024. (56)	Pavlidi N, Monastirioti M, Daborn P, Livadaras I, Van Leeuwen T, Vontas J. (2012) Transgenic expression of the Aedes aegypti CYP9J28 confers pyrethroid resistance in Drosophila melanogaster. Pestic Biochem Phys. 104(2):132-135. DOI:10.1016/j.pestbp.2012.07.003. (55)	Vontas J, Kioulos E, Pavlidi N, Morou E, della Torre A, Ranson H. (2012) Insecticide resistance in the major dengue vectors Aedes albopictus and Aedes aegypti. Pestic Biochem Phys. 104(2):126-131. DOI:10.1016/j.pestbp.2012.05.008. (52)	Roditakis E, Morou E, Tsagkarakou A, Riga M, Nauen R, Paine M, Morin S, Vontas J. (2011) Assessment of the Bemisia tabaci CYP6CM1vQ transcript and protein levels in laboratory and field-derived imidacloprid-resistant insects and cross-metabolism potential of the recombinant enzyme. Insect Sci. 18(1):23-29. DOI:10.1111/j.1744-7917.2010.01384.x. (39)	Dowd AJ, Steven A, Morou E, Hemingway J, Vontas J, Paine MJI. (2009) A simple glutathione transferase-based colorimetric endpoint assay for insecticide detection. Enzyme Microb Tech. 45(2):164-168. DOI:10.1016/j.enzmictec.2009.05.008. (32)	Ziogas BN, Nikou D, Markoglou AN, Malandrakis AA, Vontas J. (2009) Identification of a novel point mutation in the β-tubulin gene of Botrytis cinerea and detection of benzimidazole resistance by a diagnostic PCR-RFLP assay. Eur J Plant Path. 125(1):97-107. DOI:10.1007/s10658-009-9462-y. (13)	Che-Mendoza A, Penilla-Navarro PR, Martinez-Barnetche J, Rodriguez-Ramirez A, Hemingway J, Vontas J. (2005) Cloning and sequencing of the probable gene responsible of the DDT resistance in Anopheles albimanus (Diptera, Culicidae). Entomol. Mex. 6: 894-898. (5)	Vontas JG, Cosmidis N, Loukas M, Tsakas S, Hejazi MJ, Ayoutanti A, Hemingway J. (2001) Altered acetylcholinesterase confers organophosphate resistance in the olive fruit fly Bactrocera oleae. Pestic Biochem Phys. 71(2):124-132. DOI:10.1006/pest.2001.2568.